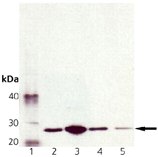 Immunogen: Recombinant rat Membrin protein with a His tag. Formulation: Liquid. In PBS, pH 7.2, containing 0.1MM PMSF and 50% glycerol. Scientific Background: Membrin, also known as GS27 (Golgi SNARE of 27K), is an integral membrane protein present on the surface of the Golgi apparatus. GS27 is a member of a protein complex that consists of cis-Golgi vesicle receptor syntaxin 5 and GS28, v-SNARE rbet1 and Rsec22, and Rsly1. These complexes are postulated to direct the fusion of ER-derived vesicles with vesicular tubular cluster (VTC), and the fusion of VTCs to form cis-Golgi compartment. Western blot analysis of VAM-PT046: Lane 1: MW marker, Lane 2: HeLa, Lane 3: PC-12, Lane 4: RK13, Lane 5: Vero. Immunohistochemistry analysis of human pancreas tissue stained with Membrin, mAb (4HAD6) at 20µg/ml.